This year’s itSMF UK Annual Conference and Exhibition – ITSM18 – will take place on 19th and 20th November at 155 Bishopsgate, London EC2M 3TQ, and this year we are shaking things up from the traditional conference format to bring you even more learning and networking opportunities. Day one will be traditional conference-style with up to four content streams covering a variety of topics, including traditional subjects such as incident, problem, and change, as well as newer initiatives and trends such as DevOps and Artificial Intelligence. On day two, alongside the streams of conference presentations, we're introducing a range of intensive 1.5-hour express workshops focusing on the essentials of service management, plus some interactive sessions to get the networking going. Gain new and advanced knowledge on service management topics, trends, and best practices. Take away practical ideas, solutions, and techniques related to topics such as DevOps, knowledge management, cloud technologies, SIAM, customer experience, and the people challenges of service management. Learn not just the “what you should be doing” and “why you should be doing it” but the practical side of “how to get started” and “how to improve”. Build your network of peers and resources, collaborate on ideas, and discuss mutual challenges. Meet with the leading vendors of service management tools, and other complementary service management offerings. Learn more about the direction in which the industry is heading (the future of ITIL, how to cope with increased business expectations, etc.). Discover new ways to encourage personal and professional development by learning more about the Professional Service Management Framework (PSMF) and accessing related case studies. Book today – £750 + VAT member rate for the full conference (non-members £950) or £395 + VAT member rate for one day (non-members £550). What can you expect from ITSM18? Why not take a few moments to watch our showcase from ITSM17 to see what can be expected from itSMF UK’s Annual Conference and Exhibition. Our useful guide explains how to articulate the value of your involvement. 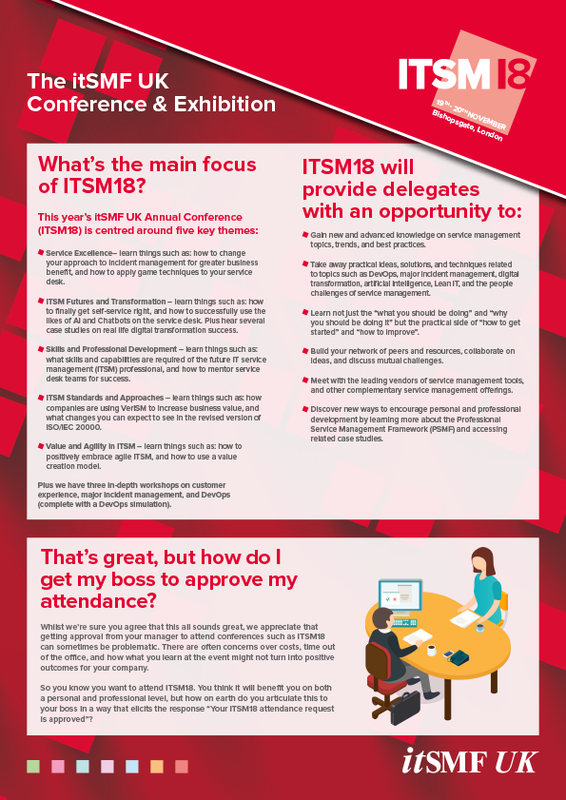 It also provides you with templates for written requests (and conference follow ups too), hotel and travel pricing, and additional information on the conference to help showcase how attending ITSM18 will benefit you on both a professional and personal level.